The green on the rocks are algae. Ok, so no, I didn’t go to enter some odd-ball place opened by a big rock like in Murakami’s Kafka by the Shore, but my husband and I went for a spontaneous drive around Senaga Island. It’s really beautiful with ocean water surrounding the small island. Many locals visit just to look out at the sea. In the distance lies the city of Itoman. It’s funny how in Japan, you can find a sprawling area of apartments and concrete buildings then look over and find a gorgeous view of the ocean. When you’re able to see this every day, the United States seems like it’s behind. Japan makes it easy to integrate nature and man-made structures, creating a harmonious atmosphere with the natural world. I wish that the United States could learn that co-existing, not crushing, what is natural–whether it’s the sea, the forests, or the people–can be a beautiful thing, like sitting on the edge of this shore. 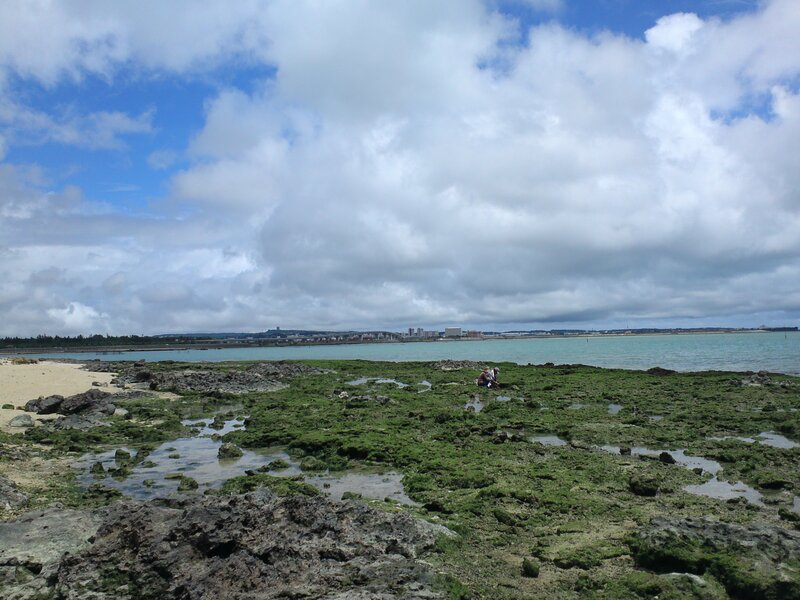 This entry was posted in Japan (日本), Life (生活) and tagged beach, Japan (日本), life, Okinawa, sea. Bookmark the permalink.